Once harvest is over, it can be tempting to put the combine in the shed and move straight on to the next task. However, an hour or two spent preparing your combine for storage can save a lot of headaches and extra expense next summer. 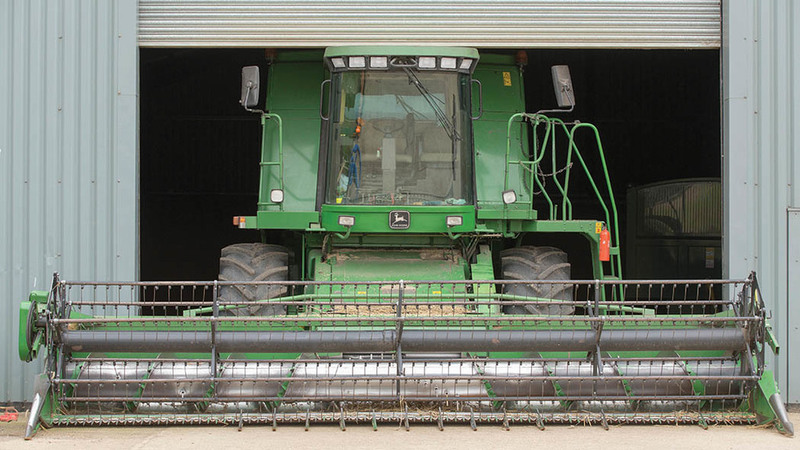 With a few simple storage techniques, a clean and dry combine harvester will mean less wear and tear or damage, less chance of breakdowns or fires during harvest, and ultimately it will save you time and money. To guide us through a few combine storage tips, we talked to tyre and wheel supplier Brocks Wheel and Tyre. The two best tools for cleaning combines are a pressure washer and an air compressor. If you do not have a compressor, a leaf blower is also effective. First, clean any crop residue and debris with the air compressor. Compressed air is better than a pressure washer as it cleans without leaving moisture in the combine. Make sure you clean dirt from around any bearings and any crop which has wrapped itself around any shafts during harvest. Other areas which are sometimes missed are the grain tank and pan. For a more thorough clean in some areas, such as panel work, you may need to use the pressure washer. However, be careful not to pressure wash any electrical connectors, or any shaft seals and bearings. While you have the shields off for cleaning, it is a good time to look for any damaged or worn parts which need repairing. Combines get used intensively for a short time of the year, which often results in worn or damaged parts. While parked up for winter or before it is put away, it is a good time to make repairs or replace worn parts in time for the next season’s harvest. This saves down time and headaches, and potentially money, at a later date. 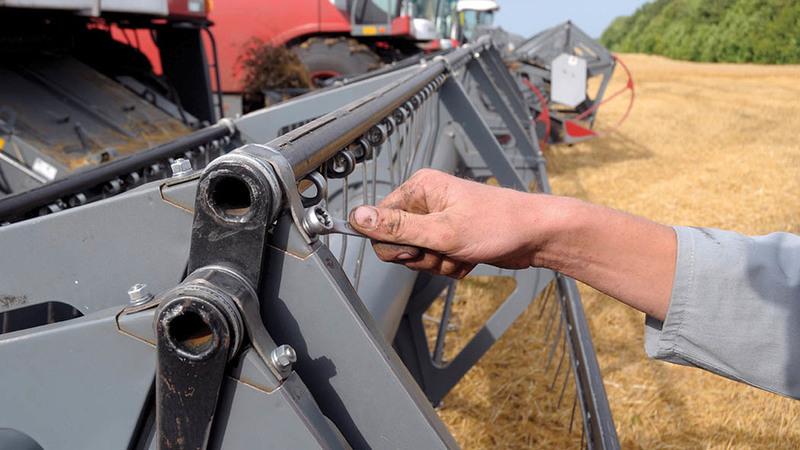 If you do not have the time to make repairs on the combine until the quieter months, it is advisable to make a note of all the things you need to fix or repair on the combine. Six months later, there is a good chance you or your mechanic will have forgotten them. 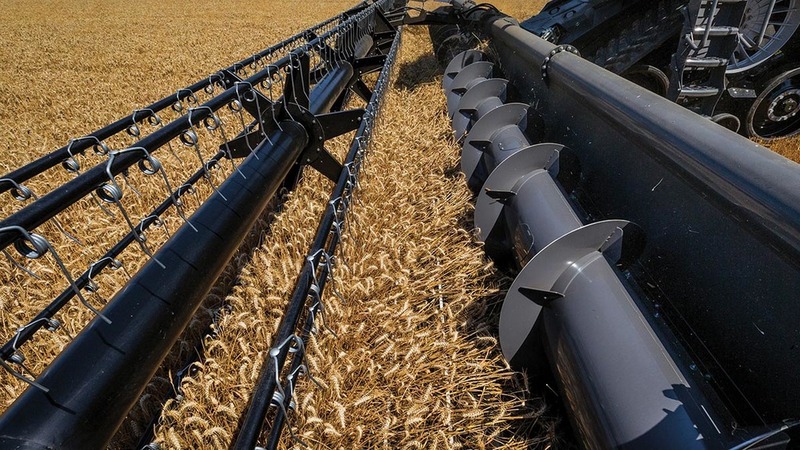 There are several steps you should make to the combine before storage, if unwanted breakdowns and issues are to be avoided when it comes to the next season. Fuel Tank: To prevent water from condensation building up in the fuel injection system and diesel tank, fill the fuel tank to maximum. However, consult your fuel supplier regarding this as some fuels have a tendency to separate over long periods which may need additional treatment, such as agitation for example. In addition, remember to drain the water separator before use. Battery: Remove battery and store somewhere dry. Alternatively, you could leave the battery hooked up on a ‘trickle’ charger, offering a convenient way to start up the combine periodically. Belts: Loosen belt tension slightly, but do not remove all the tension as this will cause the belt to shrink. Radiator: If you have added water to your radiator over the season, remember to replace it with coolant. Oils: Do a service check and change fluids if required. Old oil can lead to corrosion while in storage, so it is better to make the oil change before winter. Engine: When a machine is in storage for a long time, some people recommend sealing exhaust and breather outlets with masking tape. This will help stop condensation caused by changes in temperature - condensation in the engine can lead to rust. Remember to remove the tape when you start the engine. Bearings: After you have greased and lubricated, run the combine for 15-20 minutes to distribute the grease inside the bearings. Tyres: Combine tyres can be expensive to replace, so it is worth making sure you store these correctly. Brocks Wheel and Tyre recommends putting the combine up on blocks to get the tyres off the ground. This is particularly important if the area is damp. Tyre pressures should also be set at the normal pressure and are best kept out of sunlight. Oil or grease on the tyres will damage them so make sure to clean this off. 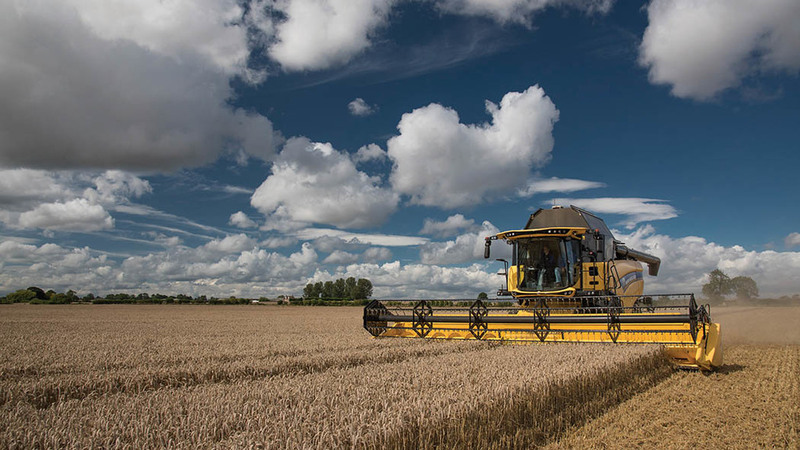 Start the combine regularly: This can be potentially useful to keep seals and the air conditioning system lubricated, as well as preventing any belts from gaining any ‘memory’. Consult the operator’s manual: It is a good idea to check this as storage techniques from one combine brand to another may vary. If you have ever gone to start your combine and found that rats or mice have spent the winter months making a home in it or (worse yet) a meal out of the wiring, then you will understand how frustrating this can be. Electronic repellents: These are sonic or ultrasonic devises which emit a high pitched sound, said to deter mice and rats. Baits and traps: These can be effective, but traps can be a lot of work emptying and resetting them. 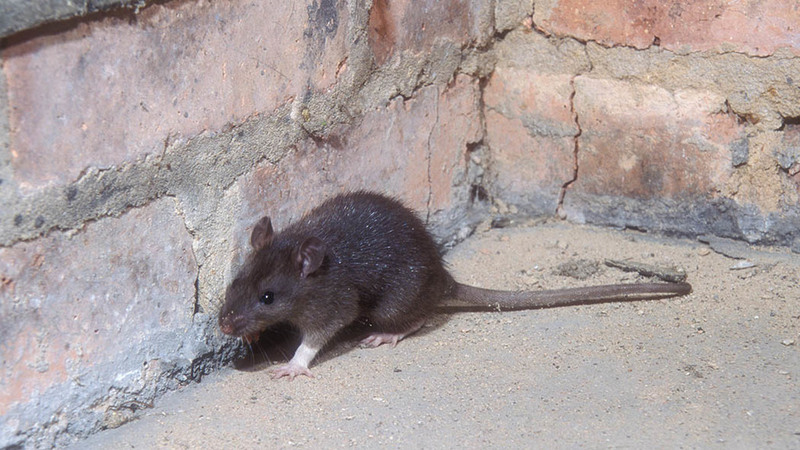 Bait and poison is a good option, the downside is that rodents will find a hidden spot to curl up and die. Dead rats and mice do not smell pleasant. Cats: A farm cat or even a Jack Russell Terrier will be effective rodent killers. Moth balls: This is said to keep mice away, but will not make them leave if they are already there. It may be worth paying a little extra to go for scented mothballs, as the smell will be quite strong in the cab. Other smelly deterrents: Irish Spring soap, mixtures of old diesel and oil and powdered or granular sulphur are all said to be quite effective.